The images above are ones that will forever be ingrained into the minds of Humanity. It was the day the dream of space took a crushing blow......and seven brave adventurers lost their lives while in pursuit of that dream. After the loss of the Space Shuttle Challenger, Humanity struggled to come to terms with the grief and the pain, and, eventually returned to space. But we must never forget the sacrifice that was made by the Challenger-7. The seven people above gave of themselves in order to increase the knowledge of all humanity. They gave of themselves willingly, accepting the risks. They are all true Heroes in the finest sense, and, sixteen years later, their dreams and visions of the future are still burning just as bright as ever before. "We go forth in your name, keeping the dream alive, remembering the sacrifice you made." On that cold day in January, I was one of the many people lined up along the highway across from the Cape to watch the launch of the Space Shuttle Challenger. It had been one of the major attractions for me when planning this vacation. A group of us had come down to Florida for a week to recharge after the Christmas Holidays. I and one other friend had left Clearwater very early that morning so as to be able to see the launch of the Challenger. We didn't try to get into the Space Center, as you have to book well in advance if you want to be there for a shuttle launch. Instead, we parked on the highway across Cape, which looked out over the water towards the Space Center, along with a large number of other people. There was flash of fire and smoke, and Challenger was away. It was a majestic sight to see......the epitomy of Man's technology and genius......lifting towards the Heavens. Then......in a flash......Challenger was gone......a fireball had taken her place, the now-famous image of her twin boosters arcing off in a huge "Y" shape. I don't recall a moment ever before in my life where there was such a silence. People stared at the sky, and finally, a sob broke the silence. There was stunned disbelief. How could this have happened???? Then, the tears came. We had all just witnessed the death of seven brave people, including a civilian woman, Christa McAuliffe, a teacher who was to conduct a class session from space. I remember hugging a woman next to me. I didn't know her, and never did find out her name. It was just such a moment where everyone helped each other, tried to comfort each other. In reflecting on it, years later, it was also a moment where we lost our innocence. Until that moment, as a young man, I had been supremely sure of myself and my place in the world. It had been an illusion. Challenger's loss proved we were all mortal, even me. We could die, as had been painfully proven to me that cold January day. It was a coming-of-age, and a bitter lesson to learn. Today, I still remember that moment, and hope to never forget. To do so would be to dishonour the brave crew who launched that day, with such bright dreams for the future. All we can do is remember, and continue to dream the dream, for them, and for us all. I was also watching that day, though not quite as close as Captain Hunter was. I was home watching the launch on television. I saw the shuttle climb into the sky, and then came the sudden fireball and billows of smoke. The two bosters following their own course as they were freed from their mountings. the news commentators had been doing their job talking about the weather and such, and hadn't wuite realized something was not right, but the realization came all too soon. I want to thank Jim for bringing this event back to my attention, and the fine word written to remember the incident by. The image above was submitted to me by Captain Hunter. Hunter is a Canadian in his real life and he wanted to show the general feeling of the United States' neighbor to the north. The tragedy is one that has effected all the decent thinking peoples of the world. I thank Mr. Hunter for pointing this out and sincerely hope to someday shake his hand in person to show my thanks. Much of America marked this day in a vareity of ways. Radio station did commercial-free programs all day long. Some playing music, others merely talking to citizens or citizens children to let them air their thoughts and feelings about the tragedy. Television stations devoted their programming to mark the one-year anniversary. I personally spent the day listening tot he radio. I also found that the sorrow felt for the lives lost was just as astrong as it was one year ago. 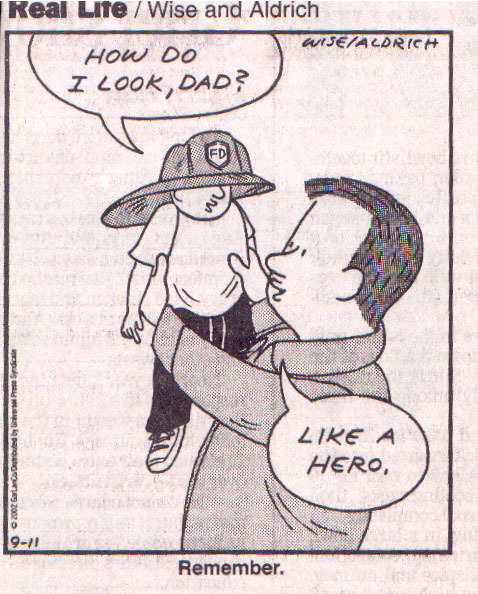 Possibly because I am a firefighter and feel FDNY's loss as all firefighters do. Possibly because I am a sensative person who still cries over sappy movies. Possibly because I can still go home and hug my children and tell them I love them. I can still watch them grow and share their joys and sorrows. There are so many fathers, mothers, sons and daughters who will no longer have that option. I invite all fo SFI's members to share their thoughts and feelings. All of these will be posted here. VAdmLanders@aol.com to e-mail me your thoughts.
" want to thank Dan Landers for this opportunity to post something on my feelings regarding 9/11. As he stated, I am a Canadian by birth. Mr. Landers also stated that he is a firefighter in real life. My real life occupation is an E.R. Attendant, and I am currently completing a Batchelor's degree in Nursing, so like Dan, I have a great deal of contact in the Emergency Services area. 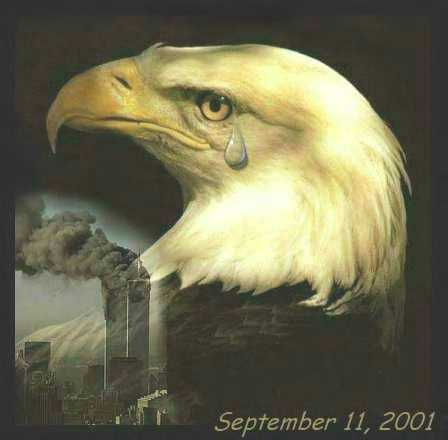 I can remember the events of September 11, 2001 as if it was yesterday. I awoke and stumbled to the shower that day. As I dried off afterward, I flicked the T.V. on. My parents were visiting at that time, so both were already up. Downstairs, the sounds of a day getting started echoed up to me. That's when I heard the dish hit the floor, along with an 'Oh My God!!' I stumbled downstairs, where we all watched the tragedy that was beginning to unfold. At first, like most people I'm sure, we thought it was just a tragic accident......a plan that had gone off-course. After all, who would deliberately fly a plan into the Twin Towers???? We watched the newscast, and all three of us nearly choked when the second plane came in. That was followed by the reports of the crash at the Pentagon, then the flight that had crashed while the passengers fought off the hijackers. I'm not sure....but I seem to recall a fifth plane being mentioned that day......one that's never been mentioned since, but I could be wrong, especially as it was such a hectic day that I may have misheard the newscaster on CNN. The events that unfolded are unlike anything in recent memory. To watch those buildings burn, to see the people so struck with terror that they jumped out the windows, and finally, to witness the death of the mighty Twin Towers themselves, it is beyond words. As I'm sure Dan Landers can attest to, in any type of career with Emergency Services, you develop a thick skin in order to deal with the daily grind. September 11, 2001 totally stripped me of that skin. It was like a raw wound to one's soul. As there was a chance that U.S. casualties could be air-lifted to Toronto, then divided to other area hospitals, I was called into work as we put our Disaster Plan into effect. Mostly, for us, it involved setting the facility up to receive the trauma patients an event like this would produce. We worked to prepare, and we listened to the news channels. I remember that long, first night. We were all kept there till the morning, when a fresh crew came in to take over the waiting game. As it turned out, we didn't receive any patients, but a large number of us also applied to be volunteers in New York should extra hands be needed. Likewise, that also didn't happen due to the ban on border crossings at that time. Mostly, I remember feeling that I wish there had been more that I could've done. It is a feeling that came back with a vengence on this first anniversary. I have also come to feel a great sense of anger towards anyone who could even suggest that the U.S. is to blame for this attack, or worse, deserved it. I have been a student of history in the past, and I can honestly say, that those of you who live in the United States of America are the kindest and most generous people on the face of the Earth, bar none. What other country helped its enemies rebuild after World War II?? What other country spends as much in Foreign Aid each year?? I am sick and tired of hearing about Hiroshima and Nagasaki, and the Vietnam War!!!! What about Pearl Habour....another cowardly attack perpetrated against America?!?!?!?! In its history, the U.S. was never the one to fire the first shot......but it was always the last player standing at the end. Those who would pan your great country are the ones jealous of what you have. America started with nothing, and built itself up to be the most powerful nation in the world. Those who would malign America are the ones who covet what you have, and, knowing that they will never possess what you have all rightfully earned, they badmouthed and insulted your country......and then they flew airplanes full of people into the sides of buildings. My feelings are unchanged from one year ago. You are a great nation, that was struck a cowardly blow. But......and this is your greatest strength......you haven't been beaten. They thought they could hurt you....and for a time, you were hurt. But you have come back, stronger and with closer ties of unity than ever before. Like the mythical Phoenix, the American Eagle has risen from the ashes of the World Trade Center to fly higher and prouder than it ever has, over the Land of the Free, and the home of the bravest souls on Earth!!!! I want to thank the American people for being who and what you are. Don't ever change. God Bless you all!!!!" February 1st, 2003, 9 A.M.
"The same creator who names the stars also knows the names of the seven souls we mourn today. The crew of the shuttle Columbia did not return safely to Earth, but we can pray they are safely home." Rick Husband had just one other space flight under his belt before he was given the role of commander. "I think a lot of it has to do with being in the right place at the right time, for starters," Husband, a 45-year-old Air Force colonel from Amarillo, Texas, said during a preflight interview. The former test pilot was selected as an astronaut in 1994 on his fourth try. Space flight was his lifelong passion, along with singing. Husband, a baritone, had barbershop quartet experience and sang in church choirs. William McCool said one of the most nerve-racking parts of training was learning to draw blood � from others. Columbia�s two pilots were exempted from invasive medical tests in orbit, like blood draws. That meant he and his commander had to draw blood from their crewmates. McCool felt bad practicing on volunteers. "I didn�t want to inflict pain," he said before the flight. The former Navy test pilot became an astronaut in 1996. This was the first space flight for McCool, 41, who grew up in Lubbock, Texas. Michael Anderson loved flying, both in aircraft and spacecraft, but he disliked being launched. "There�s always that unknown," he said before the flight. Anderson, 43, the son of an Air Force man, grew up on military bases. He was flying for the Air Force when NASA chose him in 1994 as one of only a handful of black astronauts. He traveled to Russia�s Mir space station in 1998. He was a lieutenant colonel and in charge of Columbia�s dozens of experiments. His hometown was Spokane, Wash.
Kalpana Chawla wanted to design aircraft when she emigrated to the United States from India in the 1980s. The space program was the furthest thing from her mind. But "one thing led to another," the 41-year-old engineer said, and she was chosen as an astronaut in 1994. On her only other space flight, in 1996, Chawla made mistakes that sent a satellite tumbling out of control, and two spacewalkers had to go out and capture it. Some saw this flight as her chance to redeem herself. David Brown was a Navy novelty: a jet pilot as well as a doctor. He was also probably the only NASA astronaut to have worked as a circus acrobat. (It was a summer job during college.) He said what he learned about "the teamwork and the safety and the staying focused" carried over to his space job. He joined the Navy after his medical internship, and held a captain's rank. NASA chose him as an astronaut in 1996. This was the 46-year-old Virginia native's first space flight. Laurel Clark, a Navy physician who worked undersea, likened Columbia's numerous launch delays to a marathon in which the finish line kept moving out five miles. "You�ve got to slow back down and maintain a pace," she said. The 41-year-old Clark was a diving medical officer aboard submarines and then a naval flight surgeon. She became an astronaut in 1996. Clark's chief task was to help with Columbia�s science experiments. Her hometown was Racine, Wis.
Ilan Ramon, a colonel in Israel�s air force, was the first Israeli to be launched into space. His mother and grandmother survived the Auschwitz death camp. Like his Zionist father, the astronaut fought for his country, in the Yom Kippur War in 1973 and the Lebanon War in 1982. He took part in the 1981 air strike that destroyed an Iraqi nuclear reactor. Ramon, 48, was selected as an astronaut in 1997 and moved to Houston in 1998 to train for a flight. He called Tel Aviv home. "Today, February 1, 2003 will be a day that won't be forgotten in the manner of space travel. As most of you may or may not know, the 7 brave and bold members of the Columbia were lost in a horrible tragedy. They, however, will not be forgotten. " "The Crew of Mission STS 107 were the heroes we all want to be. My prayers go out to their families, that they find the strength to deal with this tragedy, and rememeber that every member of that crew knew and accepted the risk. God Bless them and all those to follow in their path." " just wanted to take a moment to express my deepest sypathies to all my American friends who are most likely mourning this horrible tragedy today. It seems that lately, we spend more time talking about the tragedies. I don't think words can properly express the emotions of the moment. Just know that once again, your friends to the north are grieving with you." "My heart goes out to everyone including the families of the Columbia." in 16 minutes we'd be done with the toil. in a moment we knew it was time to pray. in a second we felt the joy He brings. in an instant we were at perfect peace.